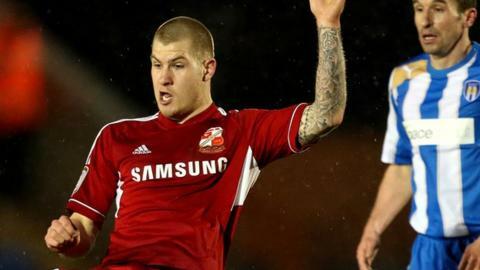 Swindon Town beat Colchester to sustain their promotion push, amid uncertainty over the future of boss Paolo Di Canio. Di Canio had stated his position at the Robins was untenable this week, because of issues with the club's ownership. But his side edged out the U's thanks to substitute James Collins's second-half goal from Gary Roberts's cut-back. Colchester's John White and Billy Clifford missed chances but the hosts could not prevent Swindon from moving to within two points of the top two. The U's, who were fresh off back-to-back victories, remain 19th, two points above the relegation zone, despite having bright spells in the game. Di Canio, who has been linked with the managerial vacancy at Nottingham Forest, was only able to name a squad of 15 out of a possible 18 because of injury and illness. The Italian was as agitated as ever on the touchline, if not somewhat frustrated by his side's lack of quality in the first half. And it remains to be seen whether the victory, which would have been more comfortable had Roberts and Aden Flint beat Sam Walker with late headers, will be enough to convince the former West Ham striker that his future lies at the County Ground. "I thought we were well in it. I think we matched them, we had as many chances to score. I think overall we're disappointed we didn't come away from the game with at least a draw. "It was a goal against the run of play. We switched off for a moment on a throw-in and it cost us. We need everybody concentrating and unfortunately we didn't at that moment and they scored what was a good goal. "Once they scored they made it very difficult for us. We just couldn't break it down and in the end we wanted something from it, so we started throwing all sorts of forwards on and went for it."